I answered honestly by telling the him that I really had no idea. Being closely involved with the markets for some time now has taught me that making predictions on where stocks are going over the short-term is a game I’m not suited for and one that’s nearly impossible anyways. No one knows what’s going to happen. There were only 60 seconds remaining in the interview so I didn’t get a chance to expand on these thoughts any further so I thought I would do so here. Within the framework of risk management it’s important for investors to have an understanding of expectations management. You need to keep your expectations grounded in reality when it comes to the performance of the various asset classes and your ability to handle risk in your portfolio. Now is not the time to expect huge returns for years to come from U.S. stocks. That doesn’t mean stock can’t continue to go up, but it would be a mistake to assume that past five years can be replicated over the next five. The green line represents the average which is around 9.8% per year. The latest reading through March 31 of this year was an annual return of 21.1%. To give you a sense of how far the stock market has come over the past few years, even if the S&P 500 were to go on to have a 0% total return over the next two years, the five year returns by then would still be almost 9% per year. Obviously there are many ways to gauge the attractiveness of the stock market and this is just one performance measure over a specific time frame. But it’s important to have an understanding of mean reversion when it comes to the broader markets. The past 5 year numbers are all over the place but they never stay elevated forever just like they can’t be kept down for long either. Most average investors make the mistake of assuming that higher returns in the stock market means things are getting better and the coast is clear so it’s time to invest. And when markets fall investors assume the worst is yet to come so they tell themselves to wait to invest until things begin to improve. In fact, a recent study from Harvard showed that in February of 2009 (during the crash), investors expected annual returns of only 3.9% a year going forward. But in January of 2000 (during the tech bubble), expectations were for 14.3% annual returns. Of course 2009 was a terrific buying opportunity while 2000 was not the time to be upping your expectations for future gains. You’d be making a mistake if you think the magnitude of the recent gains will continue indefinitely just as investors were mistaken to assume markets would never recover from the financial crisis a few years ago. It’s also important to remember that stocks don’t have to have a complete meltdown just because they’ve risen so far so fast. It’s certainly not out of the realm of possibilities, but it’s also possible that we will simply see below average gains as the market digests the recent move higher. Investors that have spending needs within the next few years (this has always been the case). Investors that have seen their asset allocation to stocks drift much higher than their target portfolio weight (this has always been the case). Investors that don’t have the willingness or ability to withstand periodic losses in exchange for longer-term gains (this has always been the case). The questions often change, but the answers remain the same. Investors don’t have to invest their entire portfolio in U.S. stocks either. The financial media focuses almost exclusively on the S&P 500 and the Dow, but there are many other regions, markets and companies to invest in around the globe. There are much cheaper valuations and higher dividend yields in most foreign markets at the moment. Diversifying globally is a fairly simple form of risk management for long-term investors at this point in the cycle and it’s easier than ever before to create a global portfolio. I like your site, but found this post a tad banal. “No one knows what is going to happen”, so let me tell you what I think is going to happen. No different from any “analyst” that’s part of the noise machine. The point here is that the majority of investors have a terrible habit of extrapolating the recent past into the future. Investors are constantly fighting the last war and making decisions using the rear view mirror based on what they wish they would have done, not what they should be doing. If you already have this figured out, good for you. Even some of the most seasoned investors (myself included) get tripped up by the recency effect. I’m not telling you what’s going to happen. I’m setting realistic expectations. There’s a difference. you say US stocks are high, but they could go higher? after reading this i almost feel deflated, is it worth investing in the US at all now, for us that have arrived late to the party? I’m just trying to add some perspective here. If you are truly a long-term investor, try not to worry about what happens in the short-term. I’m just saying that the above-average returns we’ve seen over the past 5 years are unsustainable. 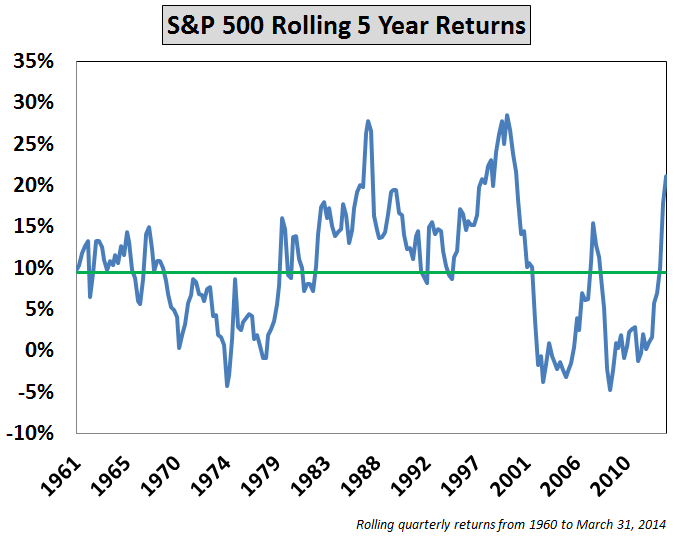 Because of mean reversion, this usually leads to periods of below average returns. But that doesn’t necessarily mean they can’t continue to climb. I’m just cautioning investors to keep their expectations in check. Again, I have no idea what will happen in the future, which is why I advocate a diversified asset allocation approach. Not trying to scare you, just keep things reasonable so investors don’t get too greedy. Well, your first mistake was being interviewed by Moe Ansari. He managed my brothers portfolio for years, and performed TERRIBLY. Moe invests in mutual funds only; I’m sure it benefits his firm more than his clients. Sounds like it was his investor’s mistake then. I didn’t know who he was before the interview. I can’t control what other people say/do only what I say/do. Yet another reason to not invest in active mutual funds.